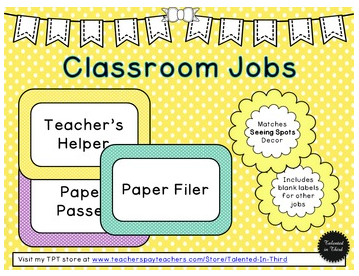 *Classroom Job Labels (7 different colored jobs, editable). All of these pages are available in an easy to edit format. • Please go to your My Purchases page (you may need to login). Beside each purchase you'll see a Provide Feedback button. Simply click it and you will be taken to a page where you can give a quick rating and leave a short comment for the product. Each time you give feedback, TPT gives you feedback credits that you use to lower the cost of your future purchases. I appreciate your feedback as it helps me determine how to improve each of my products and ensure that they are valuable for your classroom.